Prism Fitness Group brings you the most innovative functional fitness equipment and accessories, and the knowledge necessary to use them safely and effectively. The techniques are every bit as important as the products, so not only what to use, but how to use it, is critical to achieving your goals. This is true for everyone - professional athletes to those who simply want to maintain a healthy and fit lifestyle. We use simple, functional tools to achieve complex training results. Battling Ropes are one of the most effective ways of achieving a total body workout, by combining high-intensity and low-impact movements with a full range of motion in all three planes. Build stamina, gain lean muscle mass, burn fat, and strengthen core muscles. 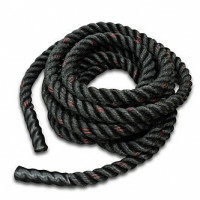 Power Conditioning Rope is 1.5" diameter, Danline/Poly blend. Please correct your Email Address.